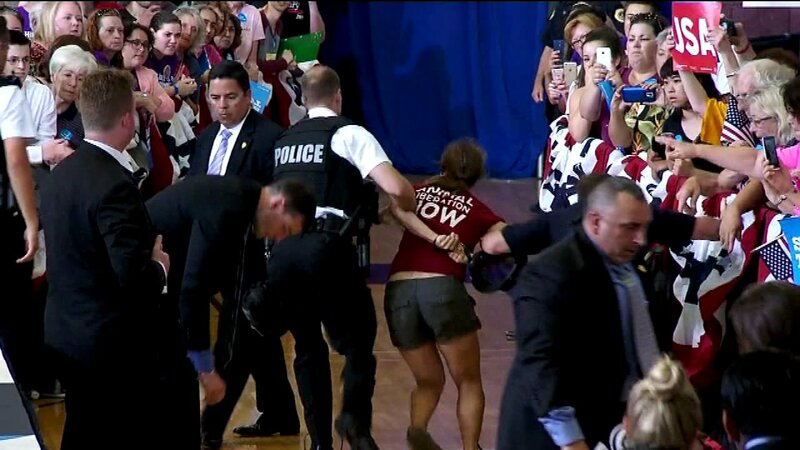 DES MOINES (WLS) -- During Hillary Clinton's campaign event in Iowa on Wednesday, a protester was subdued after attempting to rush the stage. Kelsey Atkinson, 26, traveled from Chicago to the event in Des Moines. The animal rights activist from the group Direct Action Everywhere jumped the barrier and nearly got on to the stage before being quickly tackled by several Secret Service agents and being led away. She is charged with several counts of disorderly conducts. Her friend Eva Hamer witnessed the entire incident. "I'm actually here at the jail, waiting for her to get out," Hamer told ABC7 Eyewitness News Wednesday evening.